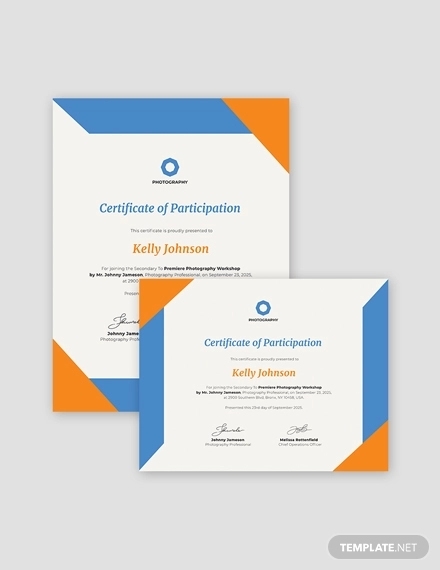 A participation certificate is given to a person when attending seminars, conferences, trainings, and so on. 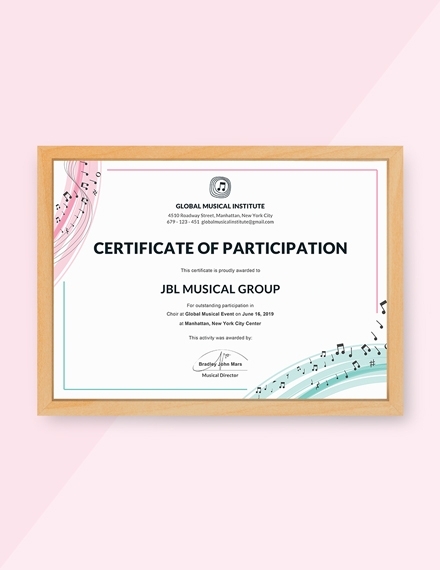 The certificate signifies that the person participated in the activities during the gathering. It also certifies that the person was indeed present and took part in the said gathering. 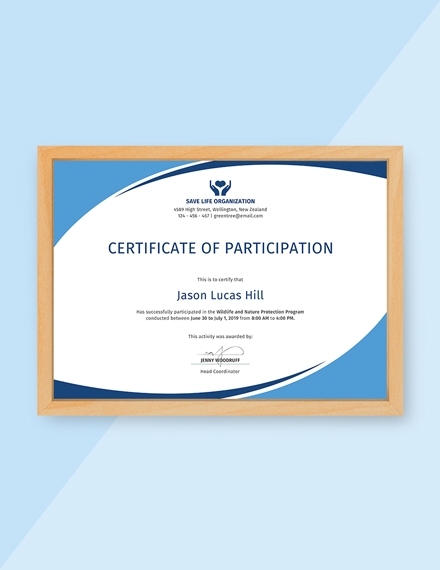 In relation to that, when a person is sanctioned to attend an event, such as training, program, or a course, a completion certificate is given to prove that not only did the person participate in said event but also completed it. Title: It is important to put a title to your participation certificate in order to give it its identification. 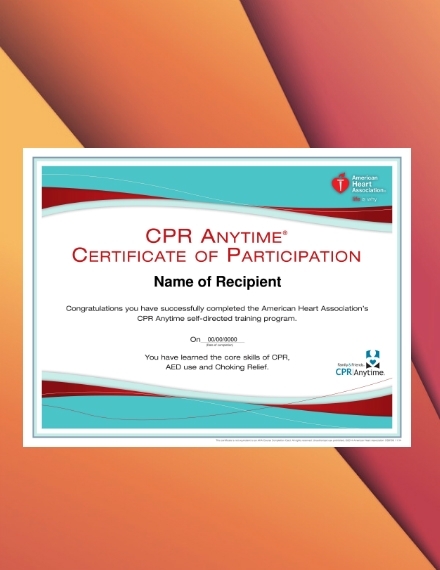 The title will serve as the heading and the first thing the reader will see; thus, it is important to provide the correct title/heading for the certificate to avoid confusion. 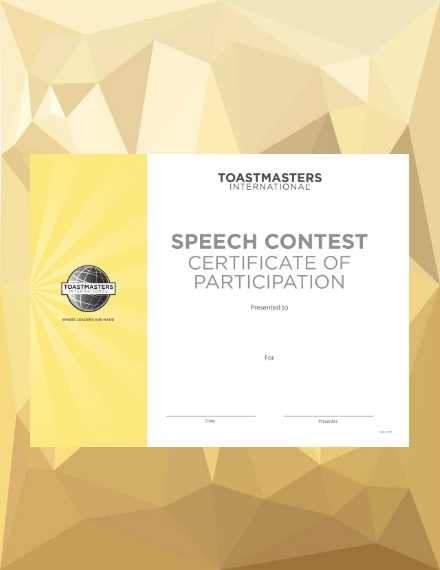 Presentation line: The presentation line is the direct statement regarding who the award is presented for. It is basically an introduction to the name of the recipient. 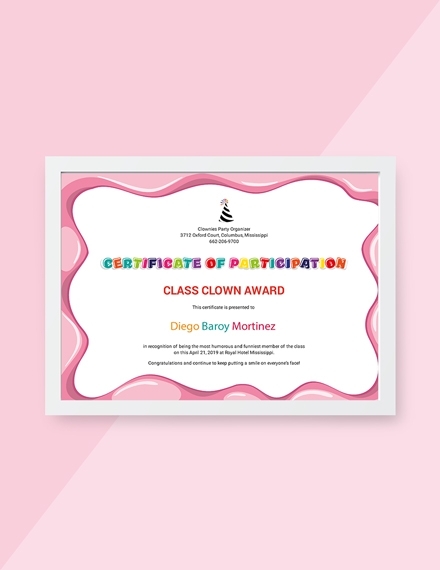 The presentation line is commonly stated as awarded to, is hereby presented to, This certificate is presented on [date] by [from] to [name of recipient]. 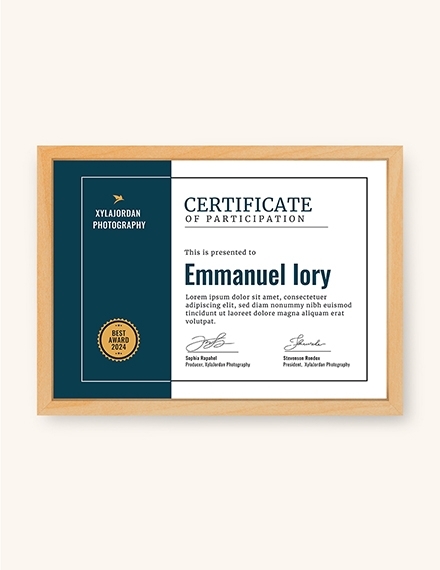 Name of recipient: Indicating the name of the recipient of the participation certificate is important, not only because it officially certifies the recipient being indicating, but more so to avoid illegal duplication of the said certificate. The name of the recipient should be written in bold letters to make it stand out from all the other text elements. 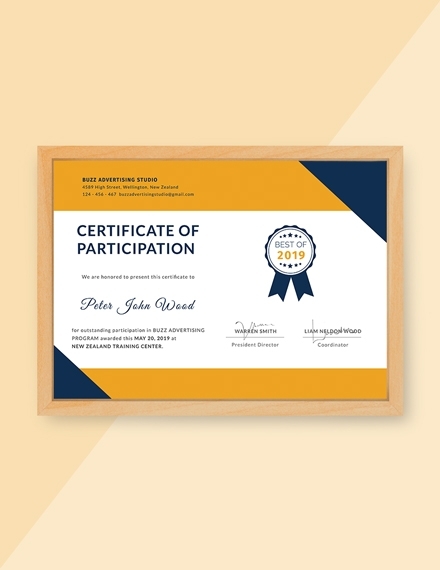 Certificate description: Usually found underneath the name of the recipient, the description of the certificate contains pertinent information about the event such as the date when the event occurred, where it was held, who initiated or organized the event. It also contains the date when the certificate is presented to the recipient. Signature: The signature of the organizer head or representative should be affixed on the bottom part of the certificate. The signature will certify for the legitimacy of the certificate and a perfect opportunity to indicate the name of the event organizer. Logo: The logo of the organizing body, say a company or organization, can be included in a participation certificate. 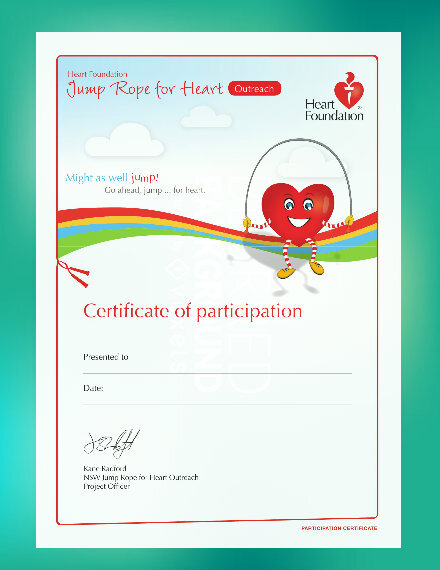 It can be placed on the top part of the certificate. The logo is another way of verifying legitimacy as well as informing others about the organizing body. Seal: An affixed signature along with the official company or organization seal is a good indication that a certificate is indeed legit and true. In some cases, there may even be an indication that a certificate is invalid should it not have the official seal. 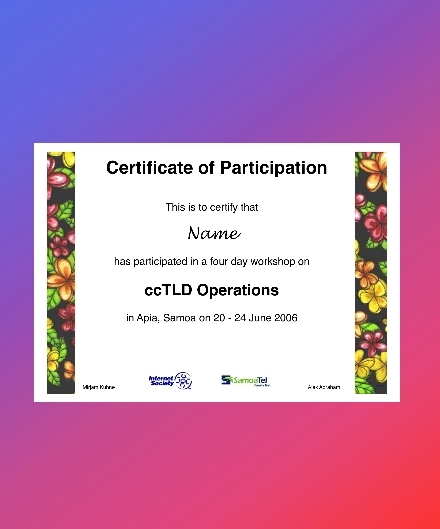 Border: Although some bordered papers are quite common to use when making certificates, manually setting the page border for your certificate is still a good way to go. The border makes sure that all your contents are aligned and centered, and that enough white space is provided. Lines: There are instances when the organizing body simple cannot print out participation certificates especially for each participant. Thus, providing lines where the recipient can fill out is also a good idea. The lines will be the intended space for certain information such as the recipient name, date when the certificate is given, etc. Open new document: After opening Word, click the blank document option. This will be the first option you will be given as you open Word. 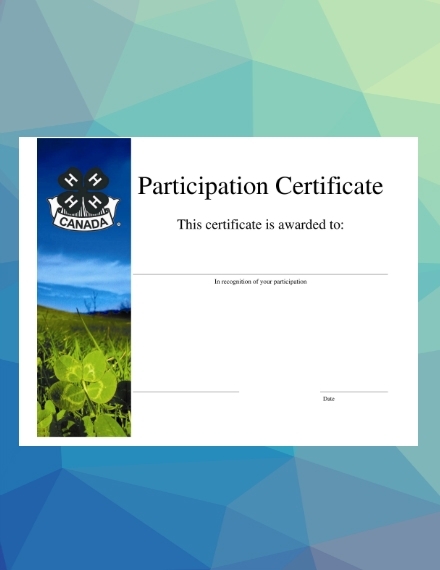 This option will give you a blank document where you can start the layout of your participation certificate. Insert image: When the document is open, click the Insert tab found on the upper part of the document. This is will open a toolbar where you can choose options on what to insert in the document. After clicking the Insert tab and the insert options are available, choose the Pictures option. This option is on the left side of the insert toolbar. A window will appear after clicking the option. Choose image: On the window, choose the image you would like to be your certificate background. Then, click insert or open found on the bottom-right corner of the window to insert the image on the document. Insert text box: Click the Insert tab again to insert a text box. By clicking the text box, a drop-down containing options will appear, choose the draw text box option on the bottom part. 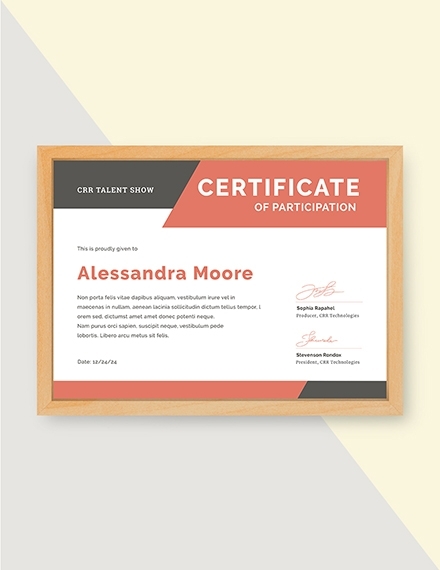 To create a text box, drag the your mouse across the place on the photo on which you want to place the certificate’s text. You can add as many text boxes you need. Type out text: Inside the text box, type out the texts intended for specific parts of the document. It is best to use separate text boxes for each specific text like the title, presentation line, recipient name, etc. Make sure there are no misspellings and errors before printing. Search template: Open Word. Instead of choosing a new blank document, click on the search bar found on the top portion of the window. Then, type out the template that you are looking for. In this case, search for Participation Certificate. Select template: After doing so, choose the template you would like to use from the various options generated from the search. When you click on the template, a new window will appear. Click create on the lower portion of this window, this will make the template appear in Word. 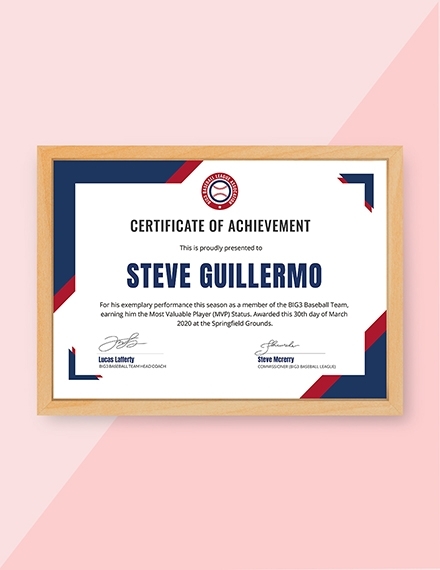 Fill in template: Fill in your certificate template with the necessary information in their designated places. Some templates have text fields you can directly type your content, so make sure you click on the template first to see if they are available text fields. Use a font style that is easy to read; use another clear font style to emphasize name of the recipient. The font size should balance out the whole document; it should cover enough white space. All aspects of the certificate must be aligned, centered, and balanced. The background of the certificate should be neat and not too crowded/messy. Make sure to add the correct spelling of the recipient’s name. Proofread and edit your first layout accordingly. 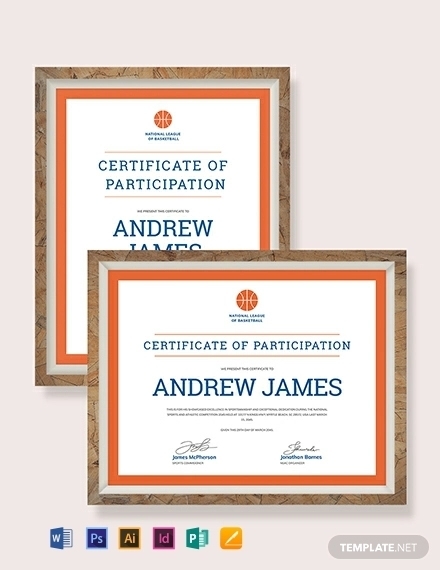 Choose a paper stock that will not easily crumple; it is better to give the certificate in a sleeve or cover. 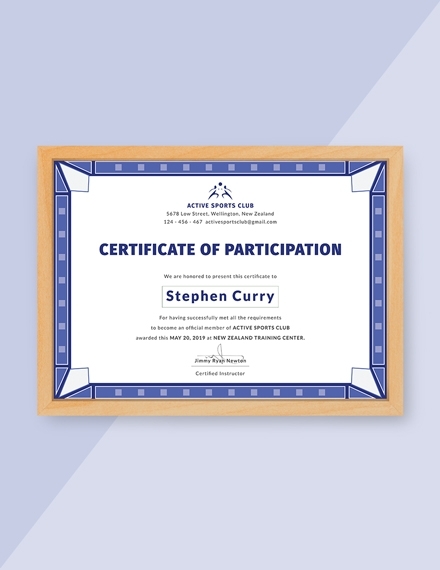 A participation certificate usually comes in the size of the standard letter paper size of 8.5″ × 11″. 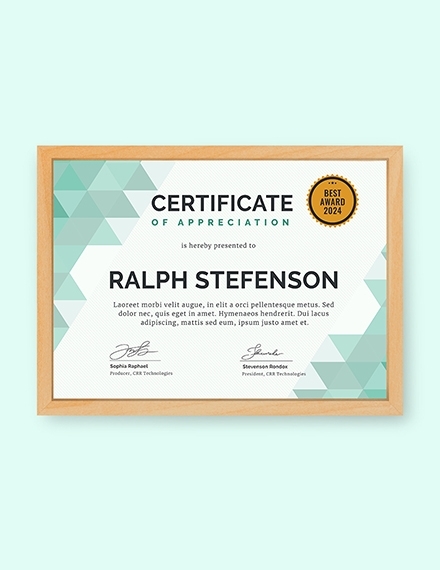 However, certificates are made of various materials and come in unique shapes and sizes. 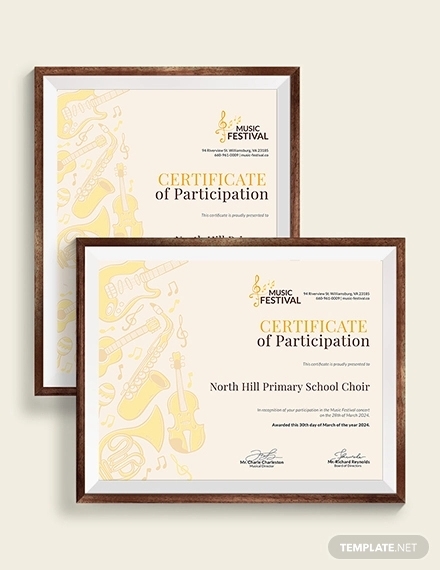 In this case, a participation certificate can come in different shapes and sizes, depending on the awarding body’s preference. 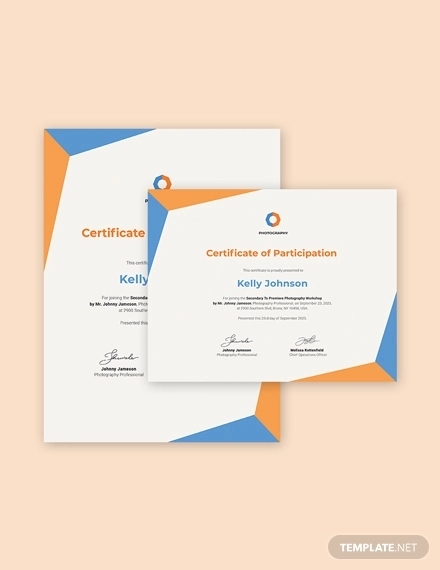 What are some good examples for participation certificate wordings? Description: for actively participating in the (name of event) held at (location/venue) on (date the event was held). The presentation line can have different varieties; it can be worded as is hereby awarded to, is presented to, is given to, is hereby bestowed upon. 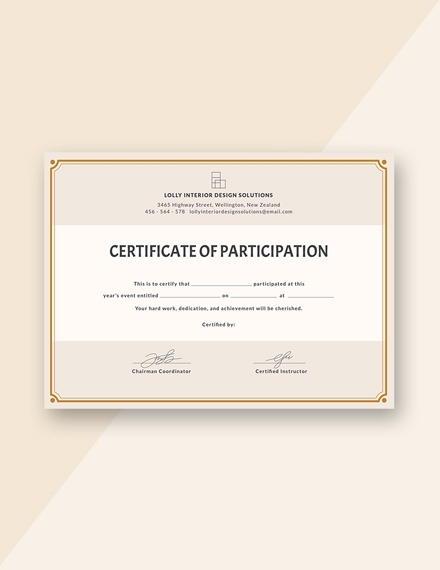 Since this is a participation certificate, the description should explicitly mention the recipient participated in the event and should contain pertinent information about said even such as the date and venue. Is better to fill out the document with designs? 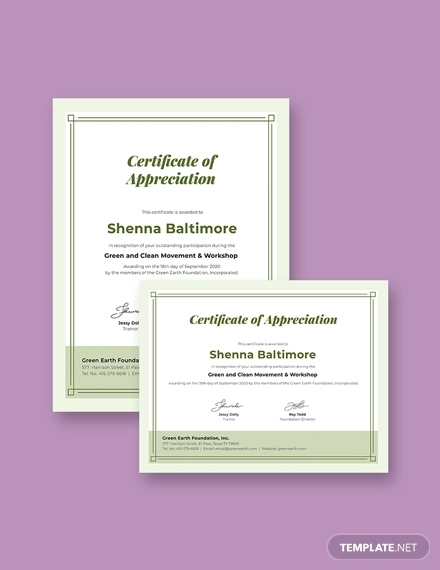 If there is too much white space on your certificate, it is best to fill out the space with design and layout elements. However, it is still important to maintain a good balance between the design elements, text, and white space.